The BBC paints a decidedly unflattering picture of Aberdeen, Washington on this 20th anniversary of the death the town's most famous son, Kurt Cobain ("Kurt Cobain's hometown no 'nirvana' 20 years after death"). That Cobain left a mixed legacy in his hometown isn't very surprising, given the circumstances of his childhood, the limits of life in a small town, his negative comments about Aberdeen as a celebrity, his drug use and suicide. Being a dead rock legend doesn't count for a whole lot for many folks in Aberdeen. If it counts at all, it's for the possibility of tourist dollars. I can't speak to Cobain's life, his music or death--I was well into folk and folk-influenced rock and paid only passing attention to Cobain, Nirvana and the grunge movement. On the other hand, I have been to Aberdeen more than once and can't say that the BBC is too far off the mark. Among the very first references to Aberdeen I heard from a native Washingtonian was "Aberdump" and while others weren't as overtly negative, most people don't have much good to say about the town which is about 50 miles west of Olympia. My first view of Aberdeen took me through a downtown that was more remnant of a better economy; I'd passed all of the big box stores on the highway east of town. Lots of empty retail space. Houses small and worn looking. Neighboring Hoquiam looked equally forlorn. Gray skies only heightened the effect. The BBC rightly notes that Aberdeen has been hit hard by the decline of logging and it shows in the empty buildings. On a larger scale, Aberdeen just looks like it's been used hard. The city's waterfront is extensive and built out for an economy that no longer requires it. Aberdeen does have a few things to recommend it, though. The city is located at the head of Grays Harbor Bay at the confluence of the Chehalis, Whiskah and Hoquiam Rivers, all of which make for a dramatic coastal setting. Most of my experience of Aberdeen has been passing through on my way to the grand places of the Olympic Peninsula; however much the area may be diminished by the "march of progress" it retains much of its innate beauty. The approach from the east along Route 12 follows the north side of the broad flood plain of the Chehalis River with its many sloughs and wetlands. Aberdeen is home to Grays Harbor Institute where Maggie and I heard Melissa Harris speak. Aberdeen is home port for the Lady Washington, Washington's semi-official tall ship. Three drawbridges span the Whiskah, Chehalis and Hoquiam Rivers. A ray of local economic hope is the construction of the pontoons for the new floating bridge in Seattle. I even ate good Mexican food at an Aberdeen restaurant. If you look closely you can see Aberdeen's positives but you can't ignore it's decline. For as much as Aberdeen disdains Kurt Cobain, the BBC would not be writing about Aberdeen but for Kurt Cobain. 04 April 2002. At Hawk Mountain Shelter with about 20 other people this first day hiking the Appalachian Trail. Red, Gary, Maggie and I are camped in the upper level of the shelter. Long day hiking--6 hours--but we got in early enough to grab a space under a roof. After dinner the sun is setting and the air is cooling. Dinner was Ramen noodles with textured vegetable protein. I still worry that we will run short of food before we reach Neels Gap. I guess the stress of the city and and getting to the trail head is still with me. Even so, today was a great day. We encountered many people, most of whom seem to be here at Hawk Mountain this evening. Sitting at the table in front of the shelter, I count seven tents. More are out of direct sight. The Appalachian Trail is a crowded place this fourth day of April. 04 April 2005. Camped at Stover Creek Shelter on the first night of my Appalachian Trail "make up" hike. Walked a blistering 3.5 miles today, barely half of that with a pack. Brother Neil drove me up from Atlanta to Forest Road 42 about a mile north Springer Mountain summit. 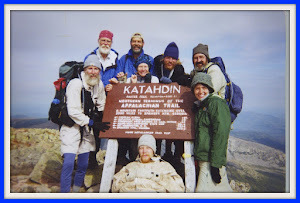 We walked south to the AT southern terminus there, touched the plaque there and returned to the road. Then I stared walking solo. Easy walking, much more so than three years ago. Feels strange to be out on my own--no Red and Gary, no Maggie, just me and this year's aspiring 2,000-milers.